"The Life of St Paul of the Cross" by Rev Father Pius a Spirito Sancto, C.P. 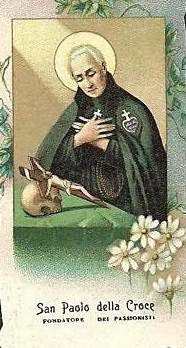 Copyright 1886, D and J Sadler and Co.
For an excellent study into the life of Saint Paul of the Cross, I highly recommend this free online book from the Passionist Nuns in Kentucky website entitled "Mysticism of the Passion in St Paul of the Cross"
The crossplace.com site appears to be defunct. I did, however, find some of the mentioned books on Amazon.